3) Type in the name of the school you want to compare in the search bar. Click on the link of the school’s name to add it to the list. 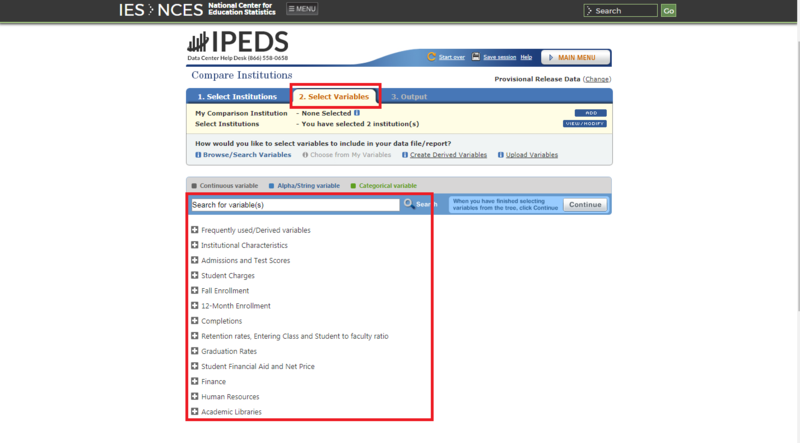 4) To add more institutions to compare to your selected school, you can look up institutions based on criteria or click the “add” button in the corner. 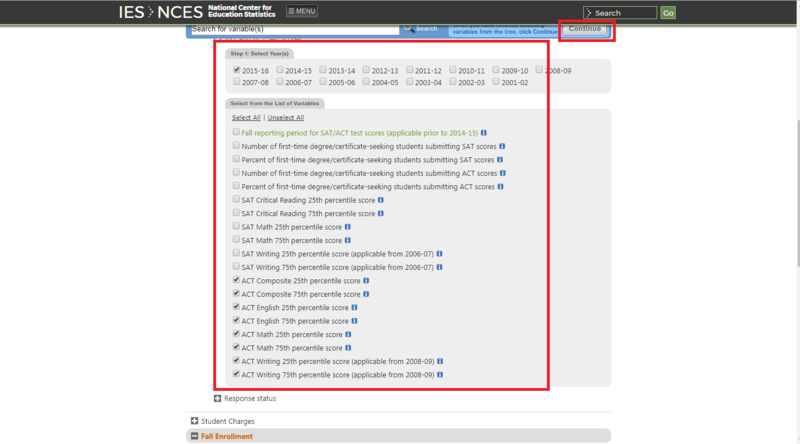 5) After selecting institutions to compare, click on the “Select Variables” button near the top to bring up multiple variables and data available to compare between the schools. Click on the “+” button next to each variable to expand the categories of the data reports that are available. 6) When selecting variables, check the boxes next to the years that you want to pull up. Then, check the boxes of the data you want to compare from list of variables that are available. After you have finished selecting the variables, click the “Continue” button. 7) You will have a chance to review the variables once more and edit options about the variables you have selected. Once you are finished reviewing the options and editing the variables, click the “Continue” button. 8) Before your data is available, you may choose how to view the data. After selecting your options, click the “Continue” button. 9) After receiving your data, you may modify the institutions to compare or the variables you selecting to pull up different data reports for each school.